Every pro blogger’s advice will include something about knowing your target audience. But as a new blogger with not much to go on, how do you figure this out? You may have defined your niche and chosen your ideal target market, but without much engagement on your content, how do you find who you are actually reaching? Having an ideal target audience or avatar defined is one thing, but knowing who you’re reaching is more important. It enables you to create content that serves your audience and keeps them returning to read what you have to say. It also means that you can create amazing products to serve your people (aka “tribe”) when you want to start monetizing your blog. By looking at other blogs in your same niche, you can get a feel for the type of content they are creating, and by seeing who their audience is, it can help you to understand who your target audience may be, even though it’s in its early stages of forming itself. It could be possible to tell from looking at their Facebook page, their Instagram and Pinterest followers, comments on their blog posts – not to be a stalker (!) but it helps you get a clue on yours! Another way to tell, is to look at who you are and what you blog about. Who are you talking to with each of your blog posts? This person is known as your “avatar”. Some beginning bloggers use themselves as their avatar when trying to define their target market, because defining the target audience and avatar will mean that you know exactly who you want to attract and can base your blog content, design, branding, etc. on that avatar. The more you blog and promote, the more you interact with readers and the more they engage with your blog, the clearer your actual avatar and target audience will become. Also be sure to keep an eye on your Google analytics for more clues. On social media, follow bloggers like yourself. You may think this is silly as it’s competition, but you have similar target audiences and there’s more than enough for us all to share and collaborate – and it’s good to support each other! Be aware of who is sharing and repining your content too. Read the comments that you get either from social media, on your blog posts or by email from readers. Some posts will get more interaction but when you get emails with questions or comments from readers, it can give you a good indication as to what the people interested in your blog are looking for. What are your most popular posts so far? Which posts have you received the most emails about? Which have been shared and repinned the most? This tells you what sort of readers you’re attracting. Google Analytics and Pinterest Analytics can provide clues here too. And where do your readers move to after reading a post? Another of your blog posts? Your freebie download? Do they sign up for your updates? Asking questions to a large group like this, will mean that other members of the group can help you to create the most relevant content, it feels more collaborative and like you’re actually helping instead of just writing for someone you don’t know. Another way to find clues on your target audience as a new blogger is by joining Facebook groups that are related to your niche. For example, if you are blogging about saving money, then you could join groups that are all about being frugal and money saving tips. Look at the things that people post. What do they need help with? What questions are they asking? This will give you an idea as to the information they need and possibly content that is not readily available which you can create and help your fellow group members with. Usually what you’re passionate about is what you want to blog about, so staying true to yourself is also necessary, and this in itself will attract your “tribe”. So when you have that avatar, when you’re starting out, go deeper and ask questions to help you understand, and therefore create content to reach and help the target audience. What do they do for work? Do they have kids or not? Do they have pets? What type of pets? What is their income? Household income? What are they struggling with? What is their main problem at the moment? If you’ve used yourself as an avatar (this is most helpful as a new blogger because you’re writing about what you’re interested in, especially initially without having much feedback to go on), you are then able to answer the questions above much more easily and therefore create your content accordingly. Where is your avatar spending her time online? For example, I used myself as my avatar. I know that I’m mostly on Pinterest and don’t have much interest in Facebook apart from the specific private blogging groups I’m a member of. So, I’m promoting Financial Freedom Footsteps on Pinterest because that’s where my avatar is spending her time. Hope this avatar stuff is not too strange and confusing, LOL! If you have any questions, please don’t hesitate to get in touch! Are you a new blogger? Did you find it difficult to define your avatar and target audience? What made things become clearer for you? 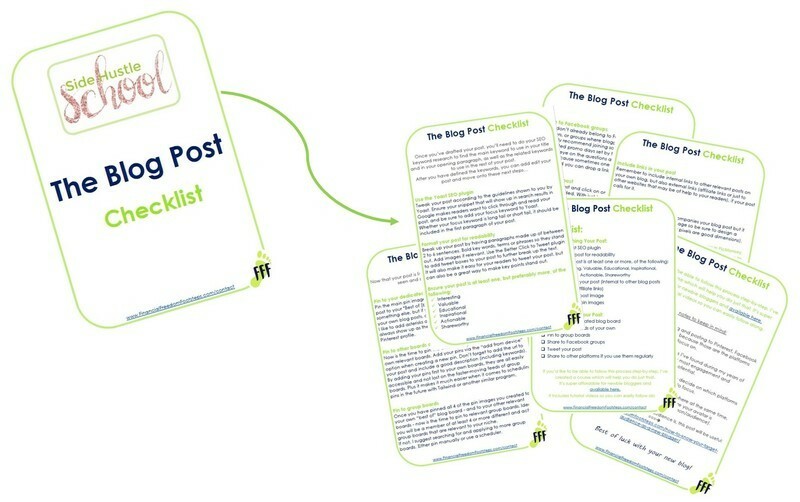 Download the free blog post checklist! Get the blog post checklist to help you create shareworthy blog posts - easy to follow and includes a simple checklist for you to check off as you go! Success! Please check your email to confirm your download. Hey! I’m Angela, creator of Financial Freedom Footsteps, a site which helps you to achieve financial freedom one small (foot)step at a time by getting out of debt, saving, starting and growing a profitable side hustle. The content here is somewhat focused on financial metaphysics, plus everything is actionable and realistic. I am passionate about my subject and helping people to achieve their side hustle potential! Step 2: like/retweet this tweet! Step 3: follow everyone else who does so!